We got a new post by Lukin, an American Girl. We gave her two samples of Albion Tight Film Foundation. The shades are #040 and #050.
wanted to adhere to my skin and stay there. your “tight” face skin? probably not. colors are too dark, I did not apply it to my face, I wanted to feel it! Also #050 appears warmer (more yellow) to my eye. Hope this helps you have fair light skin! 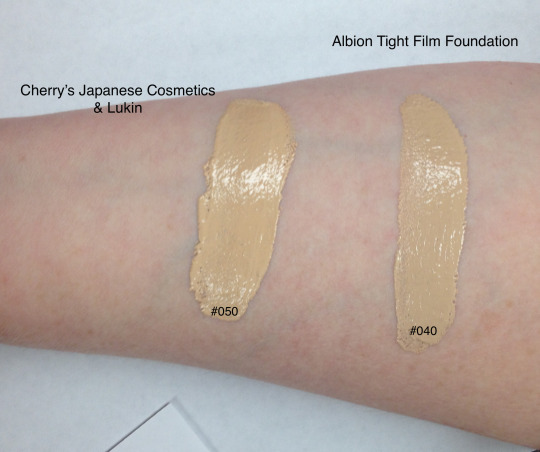 Cherry also show you blended swatch on her arm of Albion Tight Film Foundation #040 and #050. Please check the latest price, and order from here: Albion Tight Film Foundation. Wanna order in Japanese Yen? Visit our JPY Branch!